With a reliable wireless connection and intuitive controls, this remote allows you to focus on making an effective presentation. With a 4-button layout, easily go forward and back on your PowerPoint or Keynote slides, while the other two buttons let you hide your screen and use the red laser pointer. 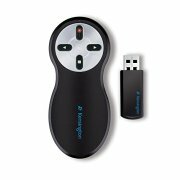 The wireless receiver is uniquely paired, so you don’t have to worry about device interference.